Dan Moore, a young volunteer from Newry, was imprisoned during the latter half of the 50's for carrying the tricolor during a republican parade. He was imprisoned again for the same reason in the 60's. He afterwards became a local leader in the Wolfe Tone Clubs, NICRA, and Official Republicanism. "Newry Journal was delighted recently to have been offered a few reminiscences of veteran Republican Dan Moore from his early days of resistance to British Rule. In the late 50s and early 60s I was in awe of this man and the Republican family to which he belonged – and my father with me. Any Republican personage or organ such as The United Irishman was considered highly suspicious by the authorities and kept under close watch. The Republican paper was actually banned and my father purchased his copy hidden within the folds of the Belfast Telegraph. That was dad’s little act of defiance. We would worry lest the house be raided and this subversive literature would lead to dad’s arrest! The open sale of this (commendable) newspaper was among the most minor of the ‘transgressions’ of the Moore family. 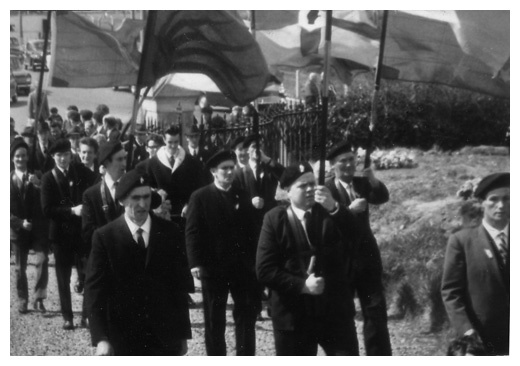 In addition every Easter Sunday Dan Moore chose to head the Republican Parade to the Republican Cemetery plot, carrying the banned tricolour. It is hard to believe now that just the display of the national flag was considered a crime worthy of the incarceration of the bearer. In punishment for this open defiance Dan was hauled off immediately afterwards and imprisoned for a period of months. I could not believe that a man could have such firm convictions that he would fritter away his freedom like this. "There were lighter moments too back in my time in the ‘Juveniles’ in 1957. The authorities were convinced that a bit of military discipline was enough to correct the misguided views and attitudes of the miscreant youths in their care. Joe Leslie, Moody and the other screws in charge of us were ex-marines. In good old-fashioned British war-film tradition they interpreted this as the need for regular ‘square-bashing’. It was supposed to frighten us and turn us into ‘good citizens’. I really enjoyed this square-bashing and threw myself enthusiastically into these exercises. I felt I was learning something every morning. As a young volunteer of just eighteen years who hadn’t yet had any drill training on the outside I was convinced I was doing something useful! Arms training we had had, but not drill. Priorities, I suppose! After about two months Joe Leslie approached me and asked why I was so patently enjoying the drill exercises. I was young and lacking in subtlety. I answered immediately and with transparent honesty that if we were to do this on the outside, it would be sufficient reason – if one were needed – to imprison us. Sadly, that was the end of my square-bashing! In punishment I suppose, for enjoying the drill and owning to it and being dismissed from ‘square-bashing’, I was given the job of sharpening the saws in the wood yard where the prisoners were tasked, for example, with cutting up timber for firewood. This was another mistake on their part. I just loved the job and though I say it myself I was expert at it. One day these two prisoners from the other side – out-and-out Loyalists – were sent to me. I saw them approaching and guessed at their mission. Covertly and calmly I drew a file along the recently-sharpened edge of the saw I had been working on. This had the effect of blunting its edge. They needed a particularly-sharp saw to fell a fairly large tree for timber. In effect they received a blunter saw than the one they returned in exchange! In response to their vociferous complaints they were both put on ‘report’ for insubordination. I recovered the blunted saw and replaced it among the ‘to-be-sharpened’ pile! I was a sentenced prisoner – for the ‘crime’ of carrying the national flag – but there were also internees over in D Wing. I knew and was known to many of them and had illicit communications with them. As a result I was able to obtain supplies that other Juveniles could not. I had sweets, butter and jam and especially cigarettes, the staple exchange-commodity of prison. I was generous with these supplies and I treated all Juveniles as equal. This link meant that I could escape the prison’s tobacco barons. These were people who would approach new prisoners with the offer of free cigarettes. The only problem was that they were not free: the debt would have to be paid back double on Sundays, when supplies would come in hopefully via family visits. One could end up forever in the grip of these tobacco barons. Not me. The screw in charge of our tier was called Dickie Dawe and with my supplies, I formed an exchange relationship with him too. Dickie knew what I was doing of course and participated. Any time I was due for a cell search – and they were frequent – Dickie would come in before it with an empty cardboard box. I placed all my supplies in it and he secreted it in his prison warden’s locker. Then nothing would be found in my cell search. Later my property was returned. My generosity was paid back in time. A few years later when I was back in prison I was met in the exercise yard by a number of prisoners who had been Juveniles with me. At once a whip-around was organised for my benefit. Again I had no need to worry about shortage of cigarettes. Some years later still I was interned along with my brothers Jack and Eugene (RIP). I sensed that Dad was up to something. I requested from the screw that he give them to me straight away. He took the pack and examined it carefully. But the cellophane was unbroken. It had all the appearance of never being opened. He handed it to me. I couldn’t wait to get back to the wing, to get to the toilets and examine the packet for myself. Inside the cigarette packed, all tightly and neatly folded was a copy of the United Irishman. How they got it fitted in there so well, I will never know. How they got the cellophane back in position is still a mystery! That must have become the most-read copy ever of the newspaper The United Irishman. Having devoured it myself I sent it all around our wing and then to all the internees and finally to all the long-term prisoners in A Wing! "Loyalist Leader on My Side"
Of course being in prison was anything but a bed of roses! There were very occasional ‘picture-shows’ but one’s absence from the cells would be taken advantage of by the screws. One time on my return to my cell I sensed something was up – that perhaps they were lying in wait fore me. And so it proved to be. I swiftly – as if in one movement – switched off the lights and for protection, grabbed my poe which was by the door. I can tell you I got in a brave few wallops with it before the screws, whose only intent was to beat me up, could overpower me! On ‘report’ the next morning I was charged with assaulting two prison warders and two prisoners. Fortunately for me the Deputy Prison Governor was on duty that morning. Under interrogation I enquired as to where the alleged assault took place. The two screws said that it was ‘on the tier’. When I challenged this I was told to be quiet. At that point Dickie Dawe spoke out and confirmed that it was in my cell. They were waiting there for me. The discrepancy of evidence was noted and taken into account. Taylor, the Deputy Governor sent me back to the wood yard. The two prisoners who gave false evidence lost their remission and all privileges and the two screws were either sacked or sent elsewhere. On reflection the Deputy Governor was probably worried that there would be a riot in the prison. But as a side-effect I earned respect from an unusual quarter. Silver McKee, a noted Loyalist hard-man was on the landing above. On that morning he leaned over the top banister and shouted down a warning that anyone who dared to touch the ‘Newry boy’ would answer to him! I never actually got the chance to meet him but it was good to know that he was there in the background for me! This was the first across-the-divide cooperation I had known. Perhaps it’s just that I got into trouble, no matter what job or assignment I was given! Yet it is strange how the smallest incident takes on greater significance as time goes by. You will all have heard of Tom Williams (friend and colleague of Joe Cahill) who was executed and buried within the walls of Crumlin Jail. We did not know the exact location so all of the area was like hallowed ground to us. One time I was given the task of mowing the grass around the prison hospital. We believed that Tom’s mortal remains were buried near the wall behind the hospital. Carefully I used the mower to mark out in cemetery fashion a spot in the near vicinity. In conclusion I marked the grave by placing some daffodils upon it. Needless to say that was the end of my grass-cutting days there. A week later I was taken off this duty!